The Nintendo eShop for Nintendo Switch has become an incredibly competitive space, and, more than ever, it’s important to see how your game can stand out from the crowd. That’s what Shelter Generations has looked to achieve, which collects a handful of experiences that explore familial love, parenthood and challenge you to nurture your cubs until they reach adulthood. Pregnant, searching for a den and hounded by wolves snapping at her heels, it’s an alarming start to Shelter 2. But it soon becomes calmer when, after resting beneath a starlit sky, the Mother Lynx that you play as gives birth to four cubs. Vavi, Kir, Solda and Bova. Or other names, if you choose to rename them. Not yet strong enough to leave their warmth and shelter, your first challenge is to hunt down something to feed the cubs with. While the developer tells you how to run (ZL Button) and jump (A Button) in the game’s opening, they let go of your hand after that point. There’s no explanation as to how or what to hunt, and, at that moment when you realise that you’re not really sure how to achieve what’s being asked of you, it can be disorientating. It was only through experimentation and randomly pressing buttons to work out what they did that I managed to learn along the way. You can use your hunter’s sense (B Button) to dull your surroundings and mark nearby prey in red, while you can pick up (X Button) your cubs in your mouth to carry them or any food that you have managed to hunt. There’s a map (L Button) and a list of far too many collectables (R Button) to find, and, well… that’s it. If anything, hunting is overly simplified. Spot a rabbit in the distance, chase after it and, if you manage to catch up, you will grab it in your mouth to carry its lifeless corpse back to your ravenous cubs to devour. It’s as simple as that, and, while you can move stealthily (Y Button) to sneak up on your food it doesn’t really make any difference. And, at that moment, I came to realise how shallow this open-world sandbox really is to exist in. The gameplay mechanics just aren’t there to engage you with the world that the developer has created. The real problem that Shelter 2 suffers from is that it is completely directionless. After the seasons change from winter to spring to summer to autumn and back, your cubs will eventually feel brave enough to run outside of their shelter. Your paternal instinct kicks in as you want to make sure that they are ok, but when, 10 or so metres from their temporary home they decided to all sit down again and wail at you, it quickly becomes hard to comprehend what you’re meant to do. I ran off to fetch another rabbit, came back and they didn’t want to eat it. And when I heard one last helpless yelp and a cub was slowly absorbed into the ground, my heart sank. That loss should have been a moment of incredible sadness and while I did momentarily mourn for the little cub, I soon drifted into complete bafflement about the whole experience. It wasn’t long before I lost two more cubs, and, determined to save the last one, I scooped him up in my mouth and hurried towards another location to see if that’s where I had to take them. I was attacked by a bird along the way that made me drop the cub, but then it just flew away. And, after reaching my destination and putting the cub down on the ground, I lost that one too. Told to return to where the cubs have been born, I was then led back to where the game started. Here I, presumably, met the father of the cubs, ran around for a bit and then the credits rolled. I will forever be a failure as a Mother Lynx, maybe that’s the whole point. But I was left with more disappointed in a game that looks far more interesting than it is to actually play. That leaves the rest of the content in Shelter Generations to make up for it. The Fables from the Den and The Lonesome Fog short stories have been recreated as living books, and, with their morals and lessons to tell, make for a rather heartwarming addition – even if we’re not used to spending our time reading on Nintendo Switch just yet. You can also sit back and listen to the Shelter 2 and Paws soundtracks, which, aside from the painterly but minimalistic visuals, are easily the best part of either experience. And then there’s Paws where you play as Inna, the Mother Lynx from Shelter 2, but from when she was a cub. This actually works far better as an experience, seeing as you know that you must rely on your own mother for survival. Despite being set in the same open world it is linear though and relies on the same basic mechanics, seeing you leap around to catch butterflies, gnaw on rabbits and be scooped up in your mother’s mouth when you aren’t following her correctly. It still has its flaws, but there are some wonderful moments like sitting and watching the stars together. To say any more would ruin what happens, but know that this is a saving grace to the whole package that’s fuelled by your own curiosity as a young cub exploring the world. Shelter Generations is a mixed bag, then. 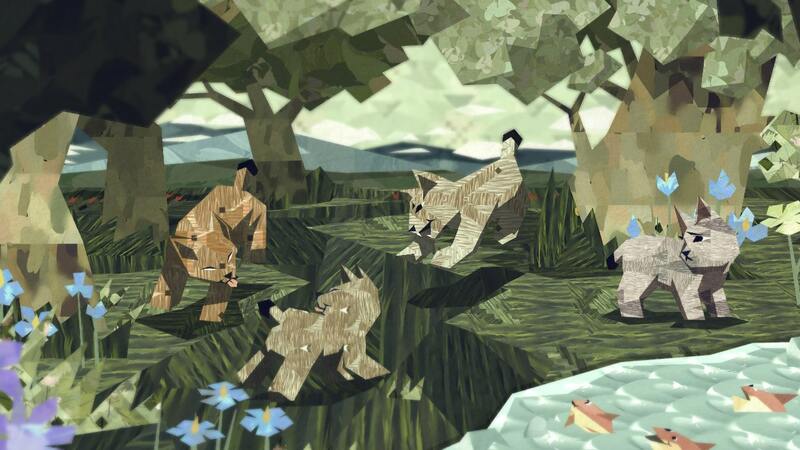 Shelter 2 is burdened with many flaws, the linearity to Paws helps it to become a more meaningful adventure, and the content that accompanies them lends charm to the whole collection. Taken as a whole it disappoints, which is a shame as, beneath the adorable exterior, the concept has far more potential than what has been achieved.